It’s that time of the year when Manchester United Cafe Bar launches its month long special menu. Last year, it was a range of pizzas, this time there are as many as 19 varieties of burgers to gorge on. 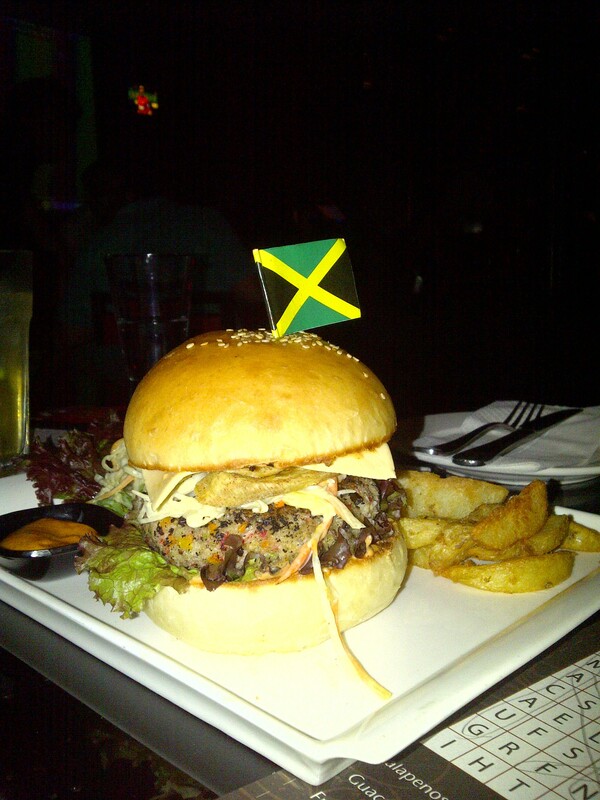 The ongoing International Burger Festival has a special menu of burgers named after soccer players from different regions. So you can choose from Baichung Burger from India, Ola Hernandez Burger from Mexico or the Zeng Cheng Burger from China, among others. The names make the burgers sound yummy already, don’t they? 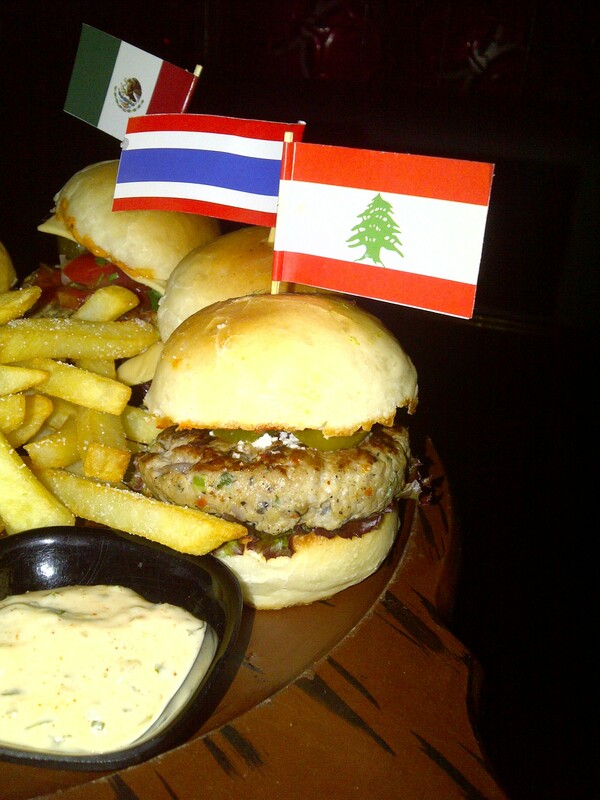 A platter of the Mexican, Thailand and Lebanese mini-burgers. The likes of Wayne Rooney, Freddy Adu and Baichung Bhutia are being dished out at a cafe bar in the city — definitely the thought of devouring these gorgeous burgers can’t just be passed on! I dropped by at Man Utd and saw many fans indulging in the long list of burgers. A glance at the menu and it was clear that a lot of thought had been put into its making. I went to MUCB determined to feast on at least 10 of the 19 special burgers. But one look at the size of each burger and I knew it would take a miracle to get past even one! That’s when I was introduced to a combo platter of 4 Mini Burgers. Cute little versions of the Thailand, Lebanese, Mexican and Indian burgers come on a tray with assorted dips and french fries. A general observation was that keeping in cue with international standards, none of the burgers were too spicy and all came with layers of lettuce, onions, customised spices and sauces. Unfortunately, the mini-burgers’ selection is restricted to only four vegetarian and non vegetarian options. A spirit dampener, because otherwise one can easily devour 10 – 15 minis. Meat lovers can rejoice as the choices range from chicken, crab, lobster, pork and beef burgers. There are a variety of combo offers too. The Old Trafford Home Combo has Indian, Mexican, Lebanese and England burgers with fries, salad and five international dips, for Rs 700 + taxes. 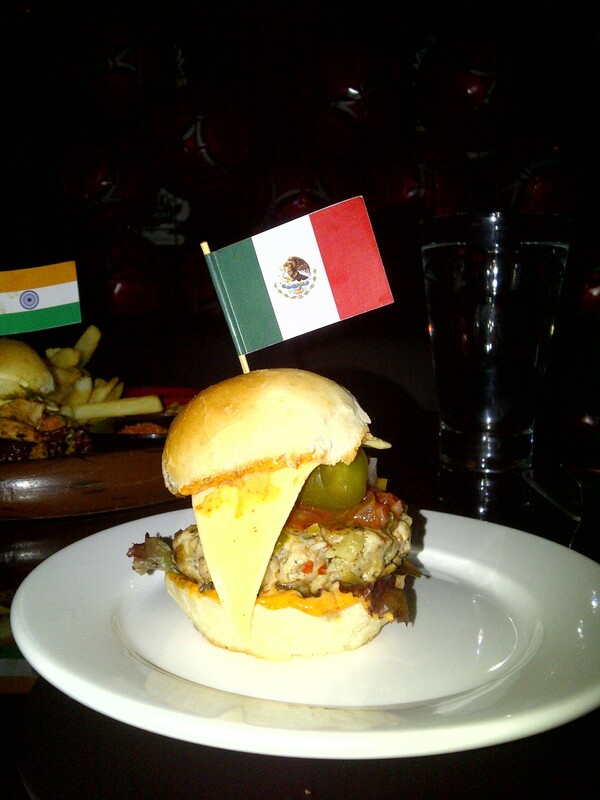 The Mexican mini-burger. Cheese slices, chicken patty, tangy salsa, chipotle mayonnaise and jalapenos. A wholesome little meal on its own! Irish House, which had only one Mumbai address till now – in Palladium at Lower Parel, now has an outpost in Kala Ghoda. My friends and I dropped by on a weekend and were pleased to see that Kala Ghoda now has another cool joint to unwind in. Looks and ambience wise, both the joints are almost identical, a common trait with most restaurant/pub chains. Dim lights, super cool music and plate full of food pretty much summarises Irish House. Yes, Ireland is a cold place and the guys like their food to arrive in big portions and they have a soft corner for beer and all things meaty. Irish House doesn’t disappoint when it comes to recreating Ireland to the core, and dare I say, it does bring to life a small yet significant piece of the local Irish culture in Mumbai. I mean think about it, aren’t you fed up of being served six pieces of perfectly sliced fried potato when you order French Fries in most joints. Ask for Nachos and you’ll be staring at a plate with 10 triangles with creamy sauce on, if you’re lucky, four of them. In Irish House, one serving of Nachos is enough to keep you going for the next hour or two. On the drinks front, the joint has several types of beer for aficionados. Murphy’s and Chinese beer to name a few. Ask for an assortment of Beer shots if you are in the mood to sample ’em all. The bar boasts of over 30 varieties of beer, Irish whiskies and single malts. Cocktails such as the Chocolate Martini (recommended) and several spiced Mojitos are also on the menu. The Mexican Mojito was a hit with those who like their drinks laced with a tangy minty flavor. We also loved the Smoked Chicken Crostini, Rs250 (smoked chicken and artichoke with mozzarella on toasted bread) and the Rolling Duck, Rs 425 (aromatic roasted duck wrapped in a spring roll and served with chili plum sauce). Lamb Pie, The Irish Lions Chicken Tenders and the Prawns Chermoula are a few of the other must-haves from the menu. On the down side, the Onion rings, which is listed as the World’s Best Onion Rings, Rs 200, on the menu is a disaster with oil dripping on the edges and street side bhajiya like coating to them and are an instant put off. But who really goes to a bar to enjoy a hearty meal? At least not anyone I know… So, generous portions of good food are just an added reason to visit Irish House. The real reason, of course, is to soak in a distinct vibe that each bar/lounge/pub emits. Irish House has an unmistakable laid back Irish charm to it. Wooden décor here plays a very vital role in establishing laid back and gung ho in the same space. Irish House doesn’t compromise on space either. There are all types of seating, near the bar, corner tables, bar stools and regular tables laid out for guests. You’ll find young collegians, corporate groups, foreigners and even senior citizens in designer garbs letting their hair down at Irish House. Obviously, a haunt that is attracting people from all walks and age groups, has to have something to write home about, no? The biggest difference, in my experience as a food addict, between the quality of preparations in a fine dining restaurant and a regular joint is how you feel, 30 minutes after your meal. Think of how your stomach feels after consuming half a plate of oily biryani from a road side joint. Most would say, stuffed and heavy, like they’ve had enough for the next two days!! Food well prepared doesn’t make you feel like that. The tummy is satiated with the food levels gradually filling you up. The soul is nourished. 36 Oak & Barley, at Kemps Corner, gets full marks for that pleasant after feeling, even though you may have just hogged on 8-10 dishes. My friends and I had that many dishes (of course, we shared each preparation), and most dishes were generous with butter and olive oil in them. I won’t get into ‘must-try’ dishes here. That, I believe, depends on individual tastes. But I will testify to the fact that dishes served had succulent chicken chunks, fresh Basa and silky Goat’s cheese in them. When the key ingredients are impressive, you can’t help but take a liking to the food, can you? Chef Nachiket Shetye, the man behind the dishes is known for mix-n-match styles; combining unlikely ingredients to come up with preparations with a twist. The Chicken Dumplings come with Spiced Thai Coconut Broth and the 36 O&B Signature Tomato and Basil Soup is served with a lump of orange sorbet. An unusual combination, you can taste spice and the fruity sorbet distinctly with each spoonful. The Ravioli, traditional Italian filled pasta, was floating in olive oil, and I soaked each square some more in the fragrant oil before gulping them down. Heaven. The dessert menu has a lot of options with chocolate in them, but we went with Nachiket’s recommendation and had the Vanilla and Berry Panna Cotta. A die hard chocolate fan, it takes a lot for me to praise desserts without any chocolate in them. But I’ll admit that this one offers balance to the taste buds, the vanilla Panna Cotta comes alive with the berry mush as an accompaniment. A rocker, indeed!!! Address: 36 Oak and Barley, 76 Nidhi, August Kranti Marg, Off Kemps Corner, Cumballa Hill, Mumbai: 400036.